For a while, in June and July, I was wondering if summer has decided to bypass us completely and transitioned from spring to autumn directly. There were plenty of grey skies, rainy days, and temperature hovering at miserable high 10s or low 20s. How unlike last year when my coats were practically kept in the cupboard between May and September… Eventually though, the crappy weather did yield in favour of sunshine and how I rejoice – time to celebrate with some spots of ice-cream tasting around town! Grom has received a lot of love from my friends and I this summer. Following Anne’s recommendation last year, this gelateria has been a staple favourite and I’d happily take any excuse to swing by for some gelato. This summer, it includes introducing the boy to it, taking visiting friends over, celebrating friend’s new job and simply enjoying the sunshine. Of course, it’s a major bonus that I live relatively close to Grom (20 minutes walk), hurrah! 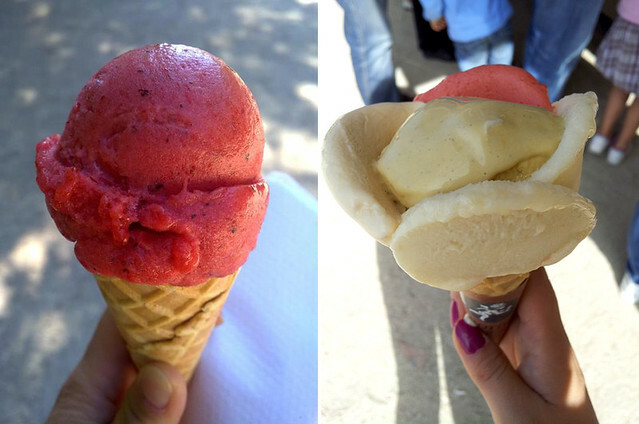 On a typical trip, I try to be sensible and stick to small cone/cup, which at €3.70 comes with 2 flavours of choice. Some day, when it gets too tough to choose, I’d up the size to medium for 3 flavours (€4.70) and ends up with a gigantic delicious portion. Oh why not, right? Their selection include classic flavours such as cioccolato, fiordilatte, caffe and vaniglia; seasonal fruits which means my favourite melone along with pesca and myrtillo (blueberry); specials of which I tested caramello al sale and cocco; and last but not least, there’s always a flavour of the month of which in August it was mango sorbet (oh yum yum yum and more yum!). A very close second comes Pozzetto near the Hôtel de Ville. They have a limited option – 12 flavours at any point of time – that rotates from their selection in accordance to season (hey, you want the right flavour profile, you wait for the right season for it!) and even then choosing is made difficult since I’m always greedy for more. A small cone/cup starts at €3.90. One very very nice thing about Pozzetto is that the cup/cone size does not correspond to the number of flavours that one can choose. That means I get to choose 1-2 flavours that I definitely want, and an option to ask for an extra flavour which I would like to taste-test. Sure I could ask for more, but I also think that may be a little rude and it’s probably also not cool to go overboard. Besides, I’ll just always go back for more, so I’d rather have good portion of limited flavours at each visit! Oh, before I forget – there is a second shop somewhere in the 17th (sorry, I’ve never been there) whereas this branch that you find me in, they also run an intimate café for some sweet things and coffee. Absolutely great when I’m craving for ice cream in the winter and it’s too cold to eat any outside. Just slip in to the café and stay warm while enjoying the melt-in-your-mouth gelati. Accordingly, Gelati d’Alberto was the first to come up with the petal shaped ice cream that since can also be found at Amorino. Since I wasn’t living in Paris when these glaciers opened shop, I can’t say. 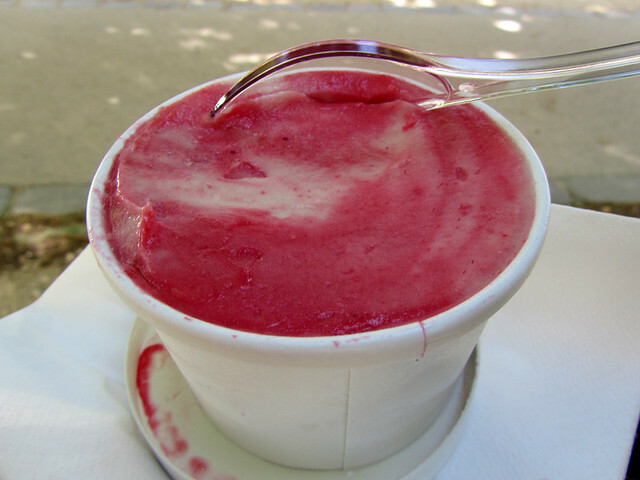 Nonetheless, between the two locations in town (one near Châtelet and one on rue Mouffetard), they serve up plenty of gelati to the locals and visitors alike. Prices start at €3.50 for a small cone/cup of two flavours (€0.50 supplement for the whipped cream) and what I like about Gelati d’Alberto is the option for exotic flavours – rose d’orient (oriental rose), thé vert litchee (green tea with lychee), Ali Baba (orange blossom, sesame and chocolate) but to name a few – along with the classics. Something different? Of course I’m game to test! Among them, for now, my favourite stays with green tea with lychee. Liting and I test-tasted his signature flavour Ispahan (which consists of rose, lychee and raspberry) and found the sorbet refreshing on a summer day, with a hint of the exotic. It is pricier than most glaciers, given the cup of 140ml costs €6.60 for this single flavour. I haven’t yet try Miss Gla’Gla but only because with on a day with crazy high temperature, I fear the ice cream would melt quicker than I can eat, and the wafers to hold them together may not be adequate enough. The original Raimo belongs to a salon du thé in the 12th arrondissement but has opened a branch on rue des Archives and more recently boulevard St-Germain. Business must be doing well there for such expansion! 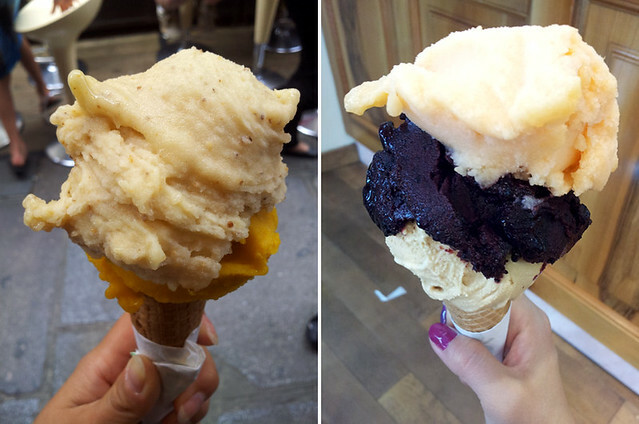 Their offerings are a bit on the pricier side – €3.50 for a single scoop, €5.00 for a double and €7.00 for a triple, this defies the price trend of most glaciers in town. 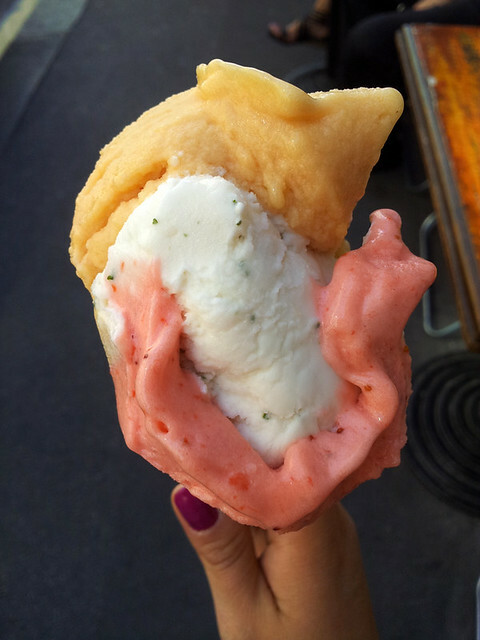 Other places I’ve hit over the summer includes the ice cream cart by the entrance of Jardin du Luxembourg (they have amazing mint strawberry) and the ever-present Amorino, with 19 locations around the city to serve flower-petalled ice cream cones/cups. They have really expanded over the years and oh, they also operate unlimited-flavour policy so if you wish, you can have every petal in a different flavour! There is a very obvious glacier missing from this list – Berthillon – argued by some to be the best French glacier. The main shop on Île Saint-Louis has been closed for most of the summer when the sun was out shining! While there are many shops around town that serve ice cream from Berthillon, strange as it may sound, I prefer to go to the mothershop itself. Hence, no Berthillon this summer. Frédéric and I were supposed to go on an ice cream tasting at Mary Gelateria today but problems/lack of organisation in the shop meant they couldn’t honour our reservation and we were sent away to come back for it another day. I was really looking forward to it (and hoping to related the experience to complete this post) so that was disappointing. I won’t go into details on how things went wrong but suffice to say, if I had not pre-paid for the session, I don’t know if I would try to go back there again. Another place that has been making the buzz is the ice cream bar at Mini Palais. I’m not entirely sure myself why I haven’t been there yet! Luckily it’ll remain open until the end of the month, so all is not yet lost. I’ll keep you posted on any progress on this front. What a beautifull selection !! Berthillon’s ice cream are wonderfull and you are right to wait for the “maison mère” to open, because it’s the only place where you can find their best ice cream : wild strawberries. It’s like paradise. 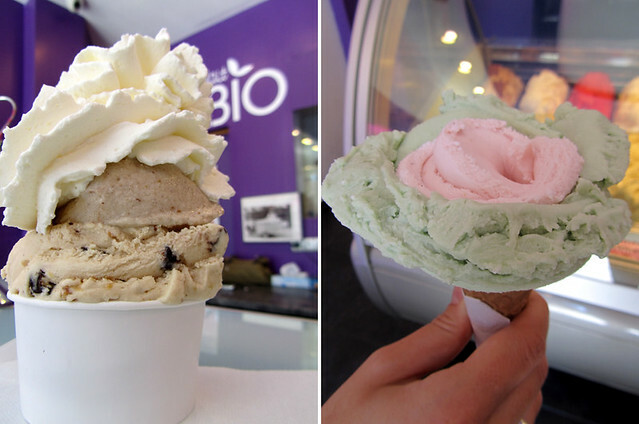 And yes, Alberto was the first to offer flower-shaped ice cream. And is a billion times better than Amorino. Well, I have been a Berthillon “wild strawberry” fan for some time, despite the price (this one has a supplement cost), but lately I’ve found it to be too sweet… Maybe it’s my tastebuds that have changed though. oh you’ve just reminded me of pierre herme with his new macaron flavour of the month – chocolate and lime. must go and get some. Wow! An impressive array of gelato! 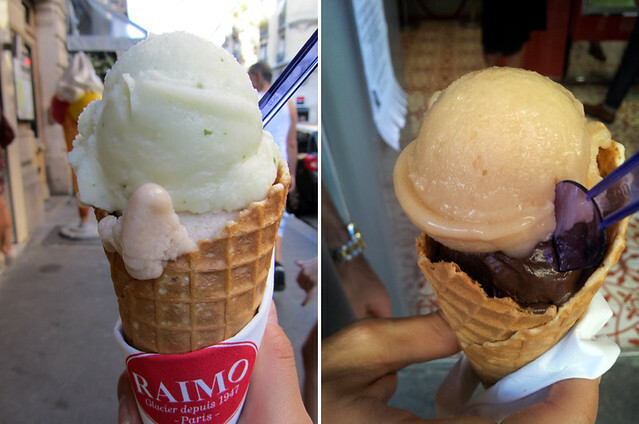 I’ve just heard of a place that sells gelato and it is not far from work. Unfortunately I was off sick the day my lab heading out for a gelato lunch. I am curious though…are the portions so huge or is it a trick of perspective? !